I take a break, best wishes! The first days of January - the morning of the year; a new section in the river of time passing. I like the morning hours. When the darkness of the night slowly gives way, the day awakens; nothing is over, you can think of the possible; still far away is the bustling of the day. And the young sun spreads a light with silent magic. I took this picture during a walk on the beach of Salalah. 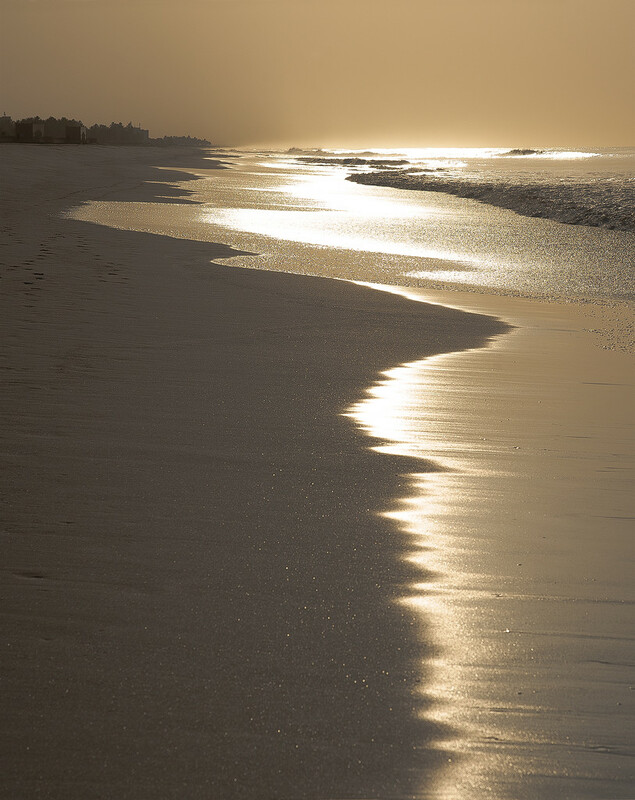 The water gleams in the morning sun and I listen to the calm and smooth breathing of the sea. I really like this rhythm in tone and movement. For me, who lives in a landlocked country, the sea is something very special. My steps in the shining sand, the flow of my thoughts, the beat of my heart,... everything is enveloped by this evenness of flooding and ebbing. Every wave is different, new and unique in the constant repetition. With this morning image, I say goodbye for a while. The professional interests occupy me, stress me, and leave me little time for other things. Often I feel impolite when I write so few comments, when I get in touch behind time. English is not my mother tongue, I feel my limitations in expression, often I’m laboriously searching for suitable words. I always hope for your forbearance. So I'm taking a break. Heartfelt thanks for the extremely friendly comments I have received! Today, as at the beginning of my participation in 365project, I feel wonderfully accepted and accompanied. Certainly I will come to visit now and then, to look at the great pictures of you, to be inspired by your view of the world. A great community, from all corners of the world, united by the love of photography - and much more than that. Have it well and nice. Oh, and I see only now the commentary... well, your photos will be missed! Take care, Jerome. Fav. I will miss your beautiful photography, Jerome. They speak volumes in mood, feeling, lighting and composition. For English not being your first language, your words translate across country boundaries. Take good care and please join us again when time allows. Wishing you and yours the very best! Auf Wiedersehen. A spectacular image with such beautiful tones and lines. I'm sorry your work is stressing you, and many of us empathize as we struggle with balancing life and 365, too. Do come back when you can and let us see your images, whether you have time to comment on others' or not. Seeing your images will inspire us. Wishing you the best. Stunning. I have to give this a big fav. This is stunningly beautiful. Your images are fantastic and inspiring. Enjoy your break and feel less stressed by the other things in your life. Alles Gute, lieber Jerome, für Ihre anstrengenden Zeiten. Es ist immer eine Freude, Sie hier mit Ihren schönen Fotos zu sehen. Komm wann immer du bereit und fähig bist. Ansonsten wünschen wir Ihnen Frieden und Kraft für alles, was Sie tun. Liebe aus unserer Ecke Englands, ich und meine "Jungs." beautiful light and composition, fav. Oh my. I so understand work pressures, I just hope you stop back by from time to time. Your work is so gorgeous and uplifting, thank you for sharing it with all of us. Beautiful photo Jerome. I will miss seeing your photos but you have to do whats best for you. Good luck! Beautiful capture. Good luck in your travels. Hope to see you back someday. I will miss your prose and your photography. Sorry you're going Jerome but I hope we see some of your pics now and again when the time allows! Sorry to hear we will not be inspired by your photos and words often. Come back when you can! I will miss your beautiful photos and texts, Jerome.. Stunning gold tones and shapes and gorgeous composition. Take care, Jerome. I'll miss your fabulous photos. Hope to see you back when you have the time. you know where to find us when you feel for inspiration, jerome. :-) and thank you for your oman photographs, it certainly rekindled the memories of my three and a half years residency in muscat. and of course re-ignited the fire to write the stories left unwritten. all the best. and just to remind you, when you come to toronto, dinner's on me. viel glück. I will miss your beautiful photos. Do you perhaps post elsewhere? Flickr? 500px? Instagram? Would love to follow even if you post only now and then. Wishing you all the best. As always, a fabulous shot. It has been a pleasure to see your photos and read your comments. Enjoy your break, you will be missed! As I come back, you go! Ships passing in the night! Lovely shot. I love your photos! Looking forward to the moments when you drop in! Hope you find time to return! Take care, Jerome. Your photos will be missed! This is stunning, Jerome. Sad to have just gotten back into 365 and enjoying your photos, and now they'll be no more, for a while anyway. I hope they'll be back. I will miss your images so much but wish you time for yourself again and to focus on other areas where needed. I'm hoping you will be back, of course, and look forward to when that happens. All the best to you! Thank you all for the many warm words! It really touches me a lot. I will try to be more personal with you when answering. But please give me some time. I certainly will not forget you. I send you very dear thoughts that come from the heart. A wonderful shot. Great light and edit. Fav! Beautiful beautiful shot - hope to see you again in the not too distant future, all the best. I love the lighting and pattern of the water. I'm sorry you are leaving and will miss your beautiful pictures. I hope you will stop in when you can. Take care. @domenicododaro Thank you, Domenico! You bring in Italian flair, I find that very enriching. To my shame, I must confess that I've never been to Rome... Of course I must have been there at least once in my life. I know Venice, Florence, a little Milan, Lake Garda, a little Naples, Mantua. Italy is great! @gardenfolk Thank you very much, CC! Your dear words touch me very much. It's a nice feeling when my pictures appeal to you. Only through our feelings we become human beings. @maggiemae Thanks, Maggiemae, for your nice comment! It was my pleasure. I am very happy about the meeting with you! I hope I can attend again soon. @jerome Drop a message if you ever come. Rome is too much, in many ways. But you must see it at least once in your life. And when it happens, let me know! How lovely for you that this exquisite photo is on the TT this week. @m2016 Thank you for your kind comment! I wish you all the best as well and look forward to seeing you again. @jyokota Thank you, dear Junko! I am very happy about your words of appreciation. The job puts a lot of strain on me. I hope I can return to photography and the great people in this community in a reasonable time. Wish you also the very best! @pistache Thank you, Clare, for your dear lines! It is not easy for me at the moment. I would very much like to dedicate myself more to photography and the so friendly people in this community. Thank you for your warmhearted companion since the beginning of my project in this forum! I still can not believe what great people are here. Certainly this is unique. @777margo Thank you, Margo, for your warm lines! Of course I will come back as soon as I have more breathing room again. And belatet: Happy New Year! @onewing Thanks for your kind comment, Babs! I am really happy about it. Unfortunately, at the moment I do not have the leisure time to devote myself to photography. Of course, the photos are the focus, but I also want to maintain the personal contact. It makes me uncomfortable if I do not spend the necessary amount of attention for the dear followers. @joansmor Thank you for your nice comment! @vignouse Thank you, Richard, for your warm words and good wishes! I appreciate your work very much and your way of looking at the world. There is always something very precious about your pictures and your words: life experience, mindfulness, character, depth of thought, sensitivity to moods and relationships. @shannejw Thanks, Shanne, for your nice comment! I am really happy about it. I will have to find a balance in my life. @bella_ss Thank you, dear Sheralee, for your nice comment! A break, yes. I have a lot to organize. But certainly I will come again. @casablanca Danke für deine herzlichen Worte und lieben Wünsche, Casablanca! Danke auch, dass du mich stets mit Zeilen in meiner Muttersprache erfreust. England... Ich muss zu meiner Schande gestehen, dass ich noch nie in England war. Wenigstens ein Mal in meinem Leben muss ich dieses Land bereisen. Recht liebe Grüße nach London! Alles Gute für dich und deine Familie! @pusspup Thank you for your nice comment! @louannwarren Thank you, Lou Ann, for your kind words! So warm and pleasant your presence always is. I really appreciate you very much. Best regards to Texas! @kjarn Thank you, Kathy, for your nice comment! I'm always excited about pictures of Australia - a strong country, a great continent. Best regards to Sydney! @ghost13 Thank you for your kind wishes! I hope to be able to participate more in the project soon. The mutual exchange in this community is very inspiring. @tonygig Thank you, Tony, for your nice visit! @moonmtn Thank you for your nice comments! Salt Spring Island... an island with a remarkable history. It must be a wonderful place - and Vancouver, British Columbia... certainly a good idea to get to know Canada from this point on. See you soon I hope JEROME. You are a big favourite on 365 Jerome...you are missed when you have a break. Very understandable though...its tricky to find the time to do this daily...and in another language. I cannot imagine how you do it. I love seeing the world through your lens. I'm always very happy about your pictures of Australia - maybe, sometime in my life, I'll come back there. I wish it very much. @gardenfolk Thanks, CC, for your congratulations! I'm very glad about that; and I'm happy about you. @lyndamcg Lynda - you are a special person for me in this community. You're the first one to comment on my first posted picture. Three years have passed since then and you still write me. That is unique. Thank you for your dear companionship during this time. Best regards to Hutton! I hope you are well. @jackies365 Thank you, Jackie, for your nice comment! @rontu Thanks, Linda, for your kind comment! I am happy to come back. I cannot not leave this community forever. In my thoughts and in my heart I stay here anyway. @bkbinthecity Thank you for your nice visit! @vesna0210 Thank you, Vesna, for your dear companionship. I hope I will soon have more opportunities to focus on photography, the community and you. @jernst1779 Thank you, Jean, for your nice comment! I will be happy to participate in the community again, when the circumstances are better again. @summerfield Thank you, Vicki, for your kind words! Dear April, thank you for your kind visit! I am not involved in any other platform. The professional circumstances currently leave me no opportunity to devote myself to photography. I hope my living conditions improve. Then I will come back. Unfortunately, there are only short visits to this community at the moment. Thank you very much for your nice company! I really appreciate that. @marijbar Thank you, Marij, for your nice comment! @rumpelstiltskin Thanks, dear Lynn, for your nice lines! I hope I have more opportunity to get involved in this great community soon. @mave Thank you, Mave, for your kind comment! Thank you, Denise, for your lines touching me. Thank you, dear Christine, for all your kind words. I promise, I'll be back. With my heart and my thoughts I stay here anyway. Thank you, dear Jane, for your nice comment! Space and time - they become void when thoughts travel to each other. No coming, no going, always there in the heart. @sstcowan Thanks, dear Shari, for your kind comment! I hope it is not my end. I'm actually planning a break. @danette Dear Danette, thank you for your kind words! I'm really happy about your visit. Certainly I'll drop by now and then. I am very happy to be inspired by the great people in this community. I hope someday I will have more opportunity to post pictures again. Best regards to Florida! I wish you all the best. @jgpittenger Dear Jane, thank you for your kind words! I also really appreciate your view of the world. I look forward to seeing you again. @radiogirl Thanks for your kind comment! Yes, I will come to visit now and then and hopefully have more time for photography and this wonderful community. @lynnz Thanks for your nice words, dear Lynn! Your great pictures are always a source of inspiration. It's wonderful to see the world through your eyes. Best wishes to Iowa! I will miss you and your wonderful photography, Jerome. You are such an inspiration! Wishing you the best and hope to see you back here as soon as it feels right to you.